$25.00 In stock. Order in the next 7 hours, 35 minutes and it will go out today! 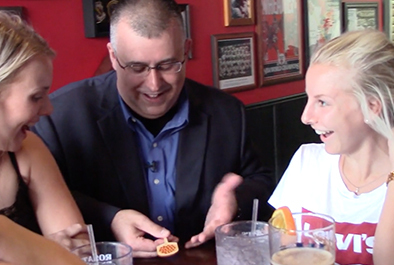 One of the biggest challenges for kids magicians is finding powerful CLOSE-UP effects for children. Rob Thompson's Pizza Paddle is one of the best solutions we've ever seen. With nothing more than the simple paddle move (learned within minutes on the instructional video) you'll be able to interact with kids up close -- in a way you can't achieve in a platform show. Best of all, the trick is themed around a subject every kid loves: PIZZA! Did you ever see a giant Pizza Paddle used in Italian restaurants to pull large pizzas from hot, brick ovens? Imagine a miniature version. Now imagine that you show both sides of the 4 ½” paddle, give it a shake, and make a tiny and oh-so-cute pizza appear. You can “remove” the pizza and “eat” it, or you can make it vanish and reappear. Best of all, creator Rob Thompson has devised a way for you to visually take it right off the paddle and hand the spectator a silver dollar-sized pizza. Click on the video to see live performance video. Our research finds that in the early 1990s, Giovanni Livera created his own version of a Paddle Trick with a miniature pizza for his competition act. Though he never published or released it, AmazeKids tips our hat to Gio's originality. Rob Thompson's independently created Pizza Paddle and the dollar-sized pizzas that come with it, are "Made in America" to AmazeKids’ exact specs. The Paddle handles like a dream and you can do lots of Coin Moves with the tiny pizzas. Click on the pizza in the cartoon picture above to check out the trailer and see some of Danny Orleans’ ideas. You’ll also see live close up performances by Rob Thompson, who specializes in close-up family entertainment, in the restaurant where he works every week. Video Instructions which include, Studio Performance, Explanation and Live Performance footage. This is a practical Paddle Trick from a working pro -- for the working pro -- all designed around one of the most popular foods in the world. Kids love pizza. Their parents love pizza. So you know they’re going to love the routine you create with the Pizza Paddle. I have been performing magic for children for 40 years. I have seen Rob perform his Pizza Paddle a dozen times. It never fails to delight his spectators. Do yourself a favor...GET THIS! You won't be sorry. I have one. It's great! Don't have mine yet but am ordering this weekend, this is the paddle that I have been looking for !! any kids magician or restaurant worker would be nuts to pass this up!! can't wait to get mine. Highly recommend for restaurant workers as well as hobbyists and pros looking for a practical trick to capture the imaginations of young children that magicians often encounter in the real world. I work in a children's hospital and have performed this trick about 100 times since purchasing it. Kids love it. Adults love it. I purchased a couple giant pennies from RNT2.com so that at the end of this trick I can turn the pizza into a giant penny. When the pizza pops off the paddle everyone is surprised. I highly recommend this trick! Excellent idea for a paddle routine. I like the props but the routine given does not quite make sense, I have adapted it slightly and now I have a great routine. The part I refer to is when the pizza appears - why show a pizza on both sides? Have you ever seen a pizza paddle with a pizza stuck on the bottom? Once the pizza appears merely show both the sides as they are, then continue. Thank you Rob Thompson for the Pizza Paddle and amazing service. I'm looking forward to using this in my walk around. Finally, a logical solution to an age old problem with Paddle tricks! A paddle that's suitable for children (i.e. not a knife) and doesn't look like a magic prop. And it comes with the ability to visually remove the pizzas. Great design. It's not too bulky, so execution of sleights is easy. Well made. Good job, Rob! You got a winner here!